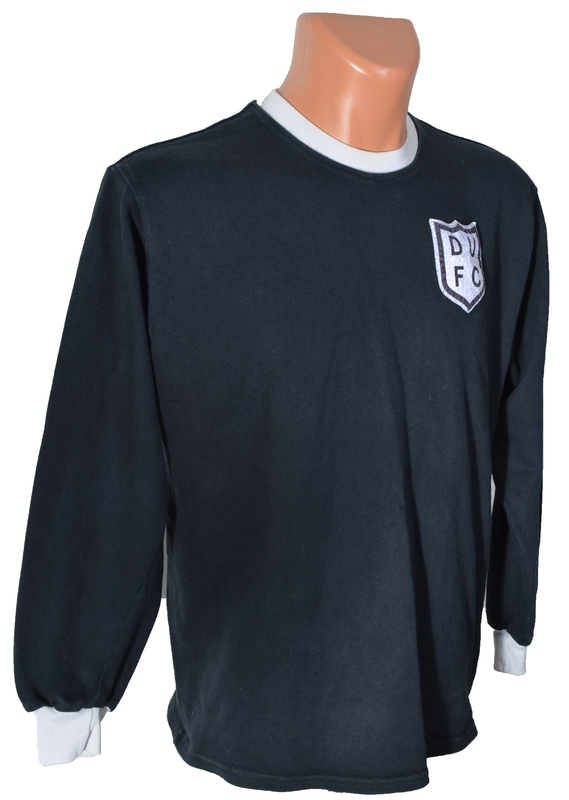 The new change kit in 1962/63 was basically a negative of the Home kit - a plain black cotton shirt, with a rounded white collar and matching cuffs, and the DUFC Shield stitched onto the left breast. This was a departure from the Away shirts from the previous few seasons, which had been mainly red in colour. Worn with black shorts and red socks with a white trim, this change kit was used for six seasons, and can mostly be seen in photographs of United playing Celtic at Tannadice throughout the mid 1960s, in a time when it was the Home team who would wear their change kit. Our records show that the kit can be traced as early as May 1963, with a photograph of Jimmy Briggs and Alec Gordon wearing it in a match against Celtic at Tannadice, although it still has to be confirmed if this was the first time it was worn. When the first tangerine kit was introduced in 1969, the black kit, along with the white kit, was occasionally used as a change kit until 1972, and can be seen in the squad photo for the 1971/72 season. As with the Home shirt from that same era, this retro top can still be bought via The Old Fashioned Football Shirt Co. (TOFFS).